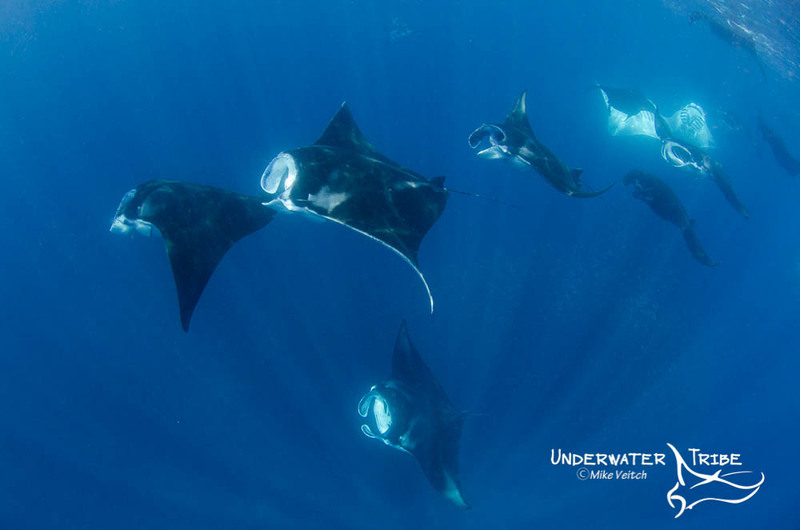 This photo is one of a series of photos from one of the best manta interactions I have had in the last 10 years. It was the 27th of Dec 2013 and I was in the Raja Ampat region of Indonesia at a site called Manta Sandy. The group of people that I was with were a large family of snorkelers who were super excited at the chance of encountering a few mantas if they were lucky (little were they to know!). We all jumped in close to the “cleaning station” at this famous dive site and drifted along the coral reef while interacting with a group of 5 or 6 mantas that were actively swimming only a few metres away from us. The water was full of small jellies and other planktonic goodness that the mantas were feeding on and they didn’t seem to mind our attention at all. After being in the water for around 30 minutes, and encountering at least 10 different mantas, the group tired of the swimming and decided to jump back on the chase boat for a few cool beverages while talking excitedly about the great manta action they had just witnessed. While the family basked in the sun, myself and the resident dive ops manager of the boat, Alex, kept a sharp eye out on the water surface to see if we could see any further manta activity. Sure enough, as the boat drifted across the channel from the manta cleaning station, we could spot plenty of manta wing tips breaking the surface. After a few minutes of watching the manta activity from a little ways away, and noticing that the guests were not in any hurry to head back to the mother ship, Alex and I asked if we could jump in the water again to “investigate” the mantas that we could see in the distance (Being the photographer that I am I of course brought my camera as well). Within seconds of jumping off the boat we were surrounded by what must have been a minimum of 30 mantas rays feeding at or near the surface scooping up the rich plankton and jellies in the water. Of course we immediately told everyone on the boat to jump back in the water and everyone had the most incredible experience of being surrounded by these magnificent creatures in a once in a lifetime opportunity! I won’t forget that snorkel anytime soon and every time I head back to Raja in December I am constantly looking to repeat it! Recently I was sent a Floatogear wrist lanyard to try out with my photo gear to see what my opinion is about this new product. Thankfully I received the lanyards 2 days before heading out on a big trip to Ambon and Raja Ampat for a couple of Underwater Tribe photo workshops and I thought they would come in quite handy. The first thing I noticed about these lanyards were that they were quite “thick” and should be able to help keep smaller items afloat. The other thing I noticed was the BRIGHT yellow colouration of the lanyard which of course was designed to stand out underwater or at the surface. Now I must admit I am not really a big fan of lanyards, I don’t use them to attach my camera to myself, never have. The reason for this is that with a big bulky DSLR housing I am constantly switching hands with it, holding it in different ways, manipulating the strobe arms etc. therefore, a lanyard would just get in the way. However, obviously the Floatogear lanyard was not designed for an SLR housing anyway but rather for smaller cameras and other accessories instead, for this function I felt I did have a few uses for the lanyard. 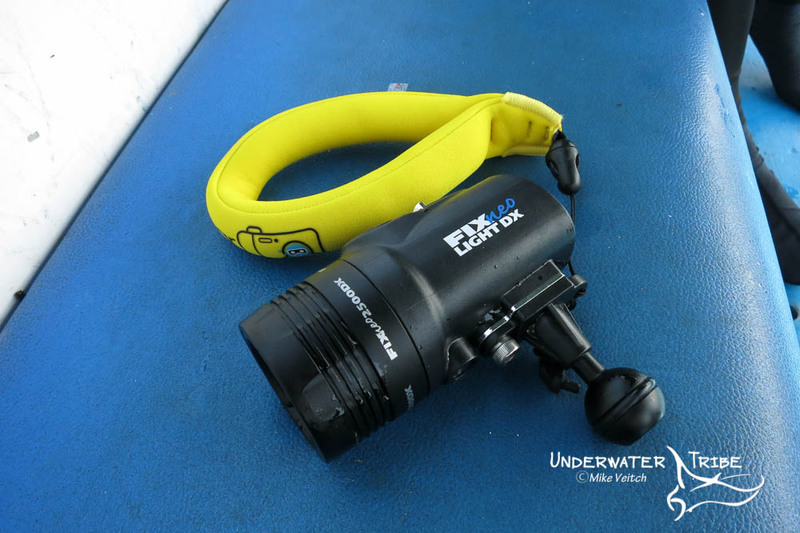 First stop on the trip was a photo workshop in Ambon at Maluku Divers Resort, on this course I would be always carrying a dive light with me in order to help the students backlight or focus on their subjects, this was the first tool that I decided to try it out on. I was very happy with the quick release lanyard solution included with the Floatogear lanyard, it allowed a quick loop on to the light without having to make any weird knots or anything. Once I hit the water the first thing I tried was to see if the “float” would be strong enough to lift the light, although not a large light, the float did not lift it from the bottom. However, to me this was actually a blessing, as I wouldn’t want something I put on the bottom to float to the surface anyway and that is not what they are meant for anyway! But the lanyard did fit very snugly on my wrist without having to tighten or loosen it and it did give me a feeling of confidence that the light wouldn’t drop off my wrist. The next item that I attached the lanyard to was my pokie stick and this proved to be where it stayed for the rest of the week. Although the lanyard was capable of floating the stick to the surface (I didn’t want that to happen obviously) it was not for that reason that I was using it. What I was using it for instead ended up being the visuals of it. When I am muck/critter diving with photography students I can often find a subject that I want my student to shoot but that student is currently busy shooting something else. When that happens I will often stick my stick into the sand to mark the location and then I swim away to work with the student on something else. However, sometimes it takes me a few minutes to find that stick once I start looking for it again! Once I attached the Floatogear lanyard to the stick I didn’t have that issue anymore, the bright yellow material stood out from a mile away and I was always able to find my stick and subject very quickly after that. Although not really made for a diver with a DSLR, I think these lanyards are well suited for are folks who are using smaller cameras and accessories in a marine environment such as paddle boarders, kayakers, swimmers, and snorkelers. These robust lanyards are secure and can “float” compact cameras and GoPros without an issue and give good piece of mind to people using cameras in or near the water. I am happy with mine and will definitely be using it again in the future, especially when shooting with my GoPro at the surface. As Floatogear is a new product they are also announcing a 30% discount when purchasing it on Amazon at the following link: Floatogear Amazon page and enter MVeitch1 as the discount code. If you are someone who uses equipment around water quite often then this is a great deal! Xeno crabs are some of the more bizarre looking critters you will find underwater. 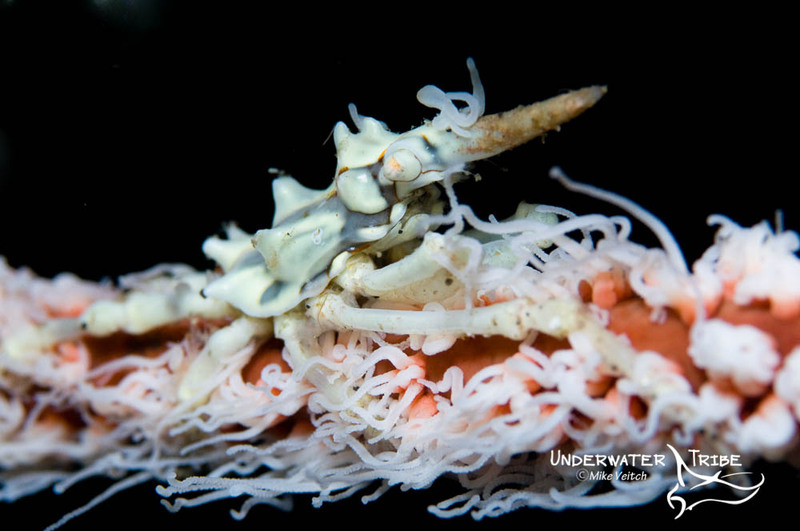 This guy lives on a wire coral on the Angels Window dive site in Lembeh Strait, Indonesia. 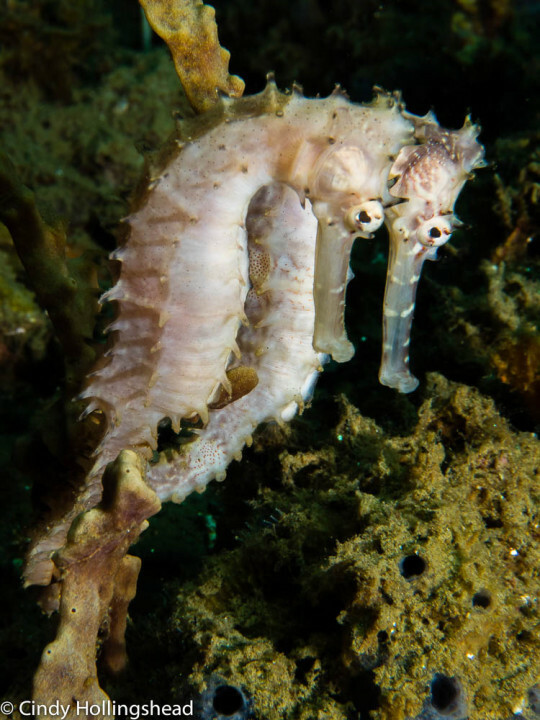 One of the cool things about spending a lot of time photographing in a place like Lembeh Strait is the fact you can bump into just about anything at any time. One of the stranger creatures I ran into happened to be when I was actually shooting wide angle and it was the perfect lens for the situation. 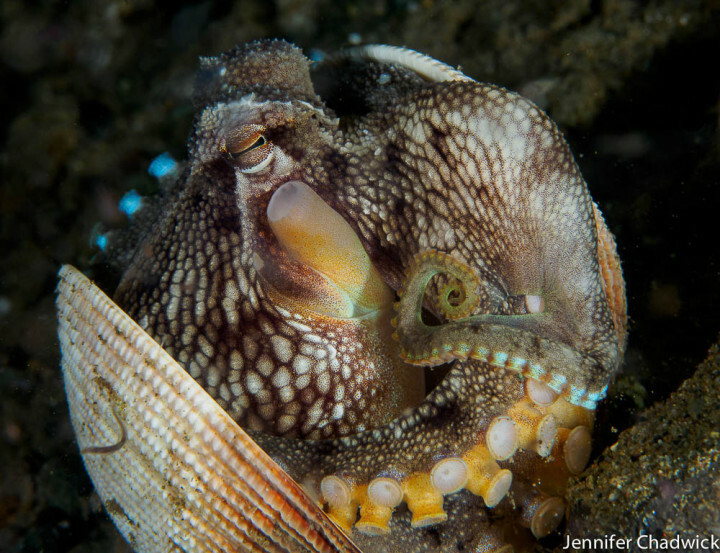 When I first looked at the animal I thought it was a snake eel (it actually could be!) but after much looking around in fish books I actually think it’s a bigeye conger eel (Ariosoma anagoides) However, it’s not the eel itself that is of interest in this photo but rather the environment that the eel has chosen to live in. 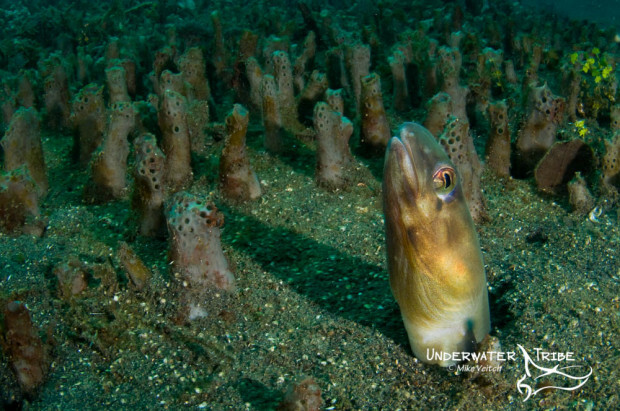 As is obvious, the eel is surrounded by dozens of tubular sponges in an otherwise rather barren stretch of sand and it blends in almost perfectly! I was very happy at this point in time to have brought my wide angle lens as only a wide angle photography could truly show the environment that the eel was living in. Now the question that immediately came to my mind when I saw the situation was: “Did the eel know that the sponges were similar in shape to it? Or was it just a fluke of positioning?” And that is the question that I ask the readers of this blog, what do you think? Was it a case of perfect planning by a cunning and intelligent animal or purely coincidence? 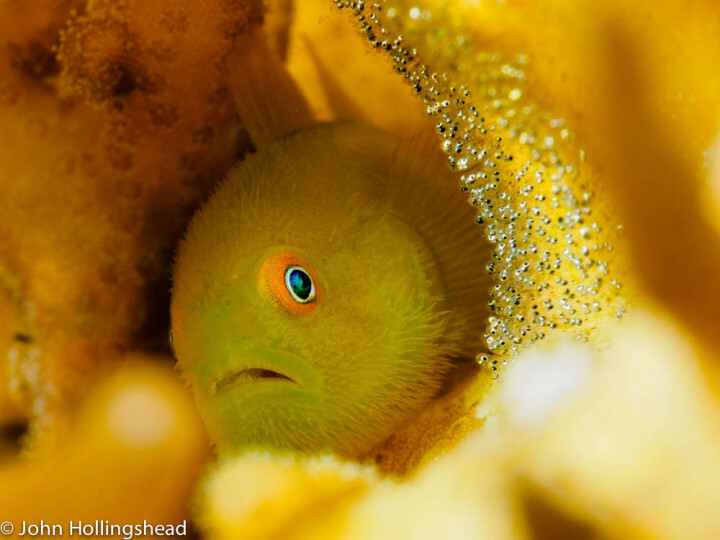 As we have recently returned from Raja Ampat on a thoroughly enjoyable liveaboard trip (Trip Report is here) with great friends and superb diving, we are slowly processing our photos and presenting them on our social media channels. 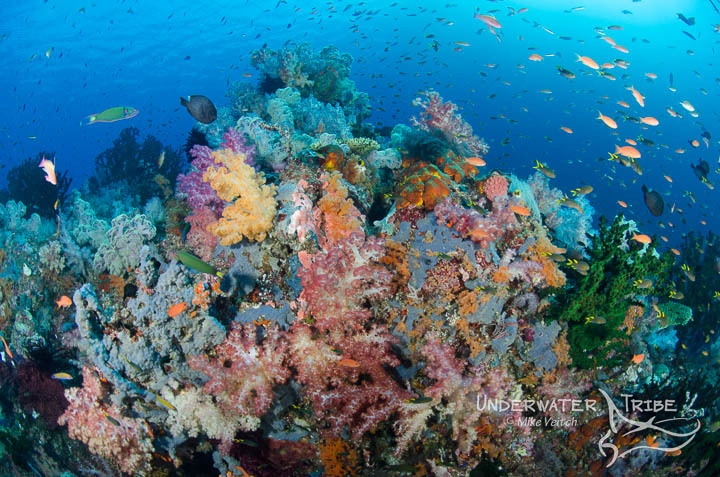 One of the highlights of our Raja trip was the dive site “Andiamo”, in the Daram island group in the SE Misool area, which is absolutely chock a block with bright and beautiful soft corals as well as plenty of fish life. 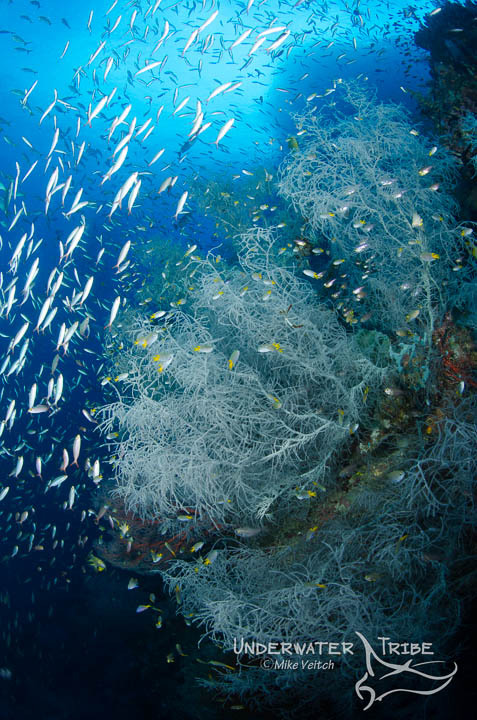 Andiamo is one of my favourite sites in all of Raja Ampat due to the variety of terrain it offers – a blue water pinnacle, a sandy flat, steep coral covered walls, a current swept ridge, and an amazing “channel” that splits the two islets of the dive site. I could dive this site (and the neighbouring sites in the Daram group) all day every day and not get bored of the myriad photo opportunities. One of the biggest challenges I always encounter (anywhere in Raja really) is capturing a decent shot of the brilliant red coral trouts that are common to the area, on this shot I think I actually captured one with a compelling foreground and background subject. 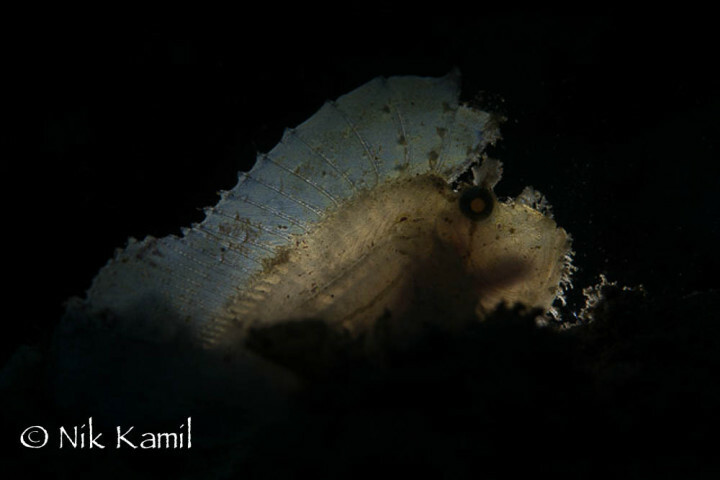 Stay tuned for more Raja, Ambon, and Banda Sea images from our epic series of Underwater Tribe trips over the past 4 weeks in eastern Indonesia. 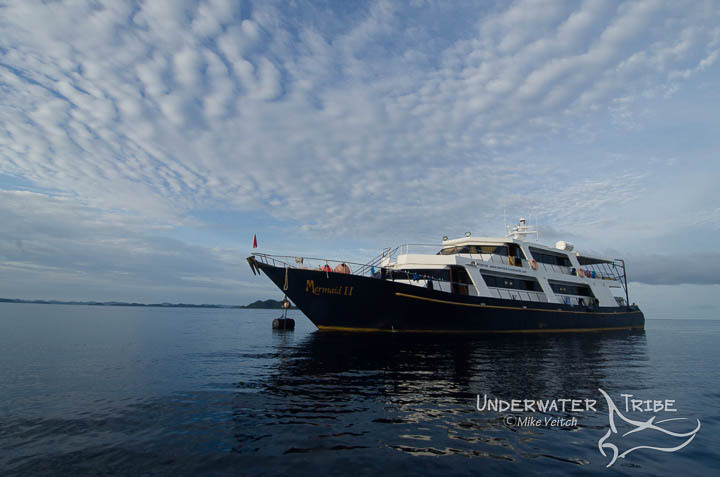 We have just recently finished an Underwater Tribe group trip aboard the Mermaid II liveaboard in Raja Ampat and there is no way to describe other than the word FANTASTIC! When we planned this trip almost two years ago, we looked at the calendar to decide what dates would work best in terms of tidal and moon phase as well as the optimal time of year for weather and we decided that the end of March would be perfect, and boy are we happy that we chose those dates! 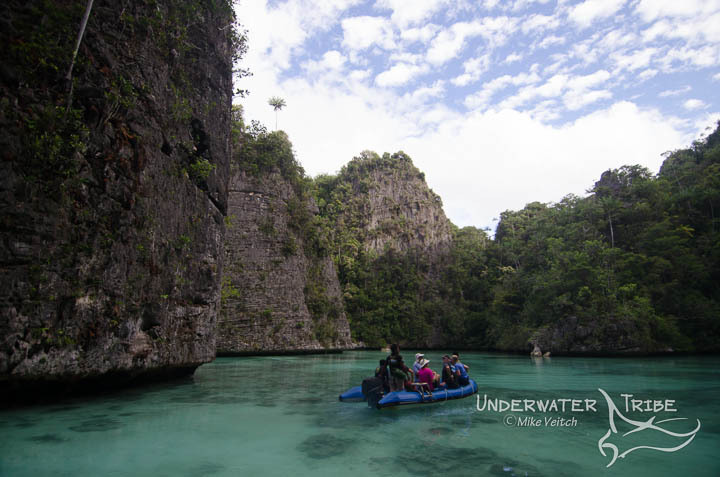 The weather and sea conditions could not have been better, the water was crystal clear, and the currents were mild which made life easy for our group of divers. 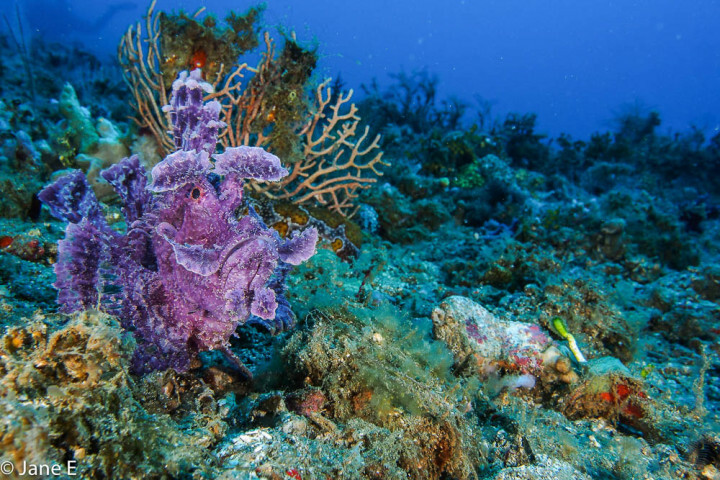 We spent the vast majority of our time in the Misool area enjoying the incredible dive sites that the area has to offer including Fansea, Nudi and Tank Rock, Whale Rock, Magic Mountain, Bo’o, and the Daram area along with a few other sites thrown in as well. In the Dampier Strait area we dove Cape Kri, Blue Magic, Arborek, Manta Sandy and Sardine. 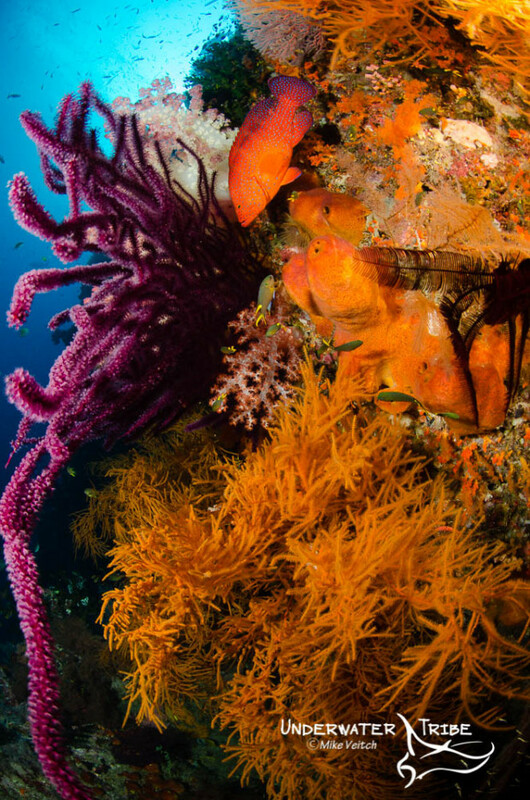 As can be expected from Raja Ampat, the fish life was prolific and the incredible amount of colourful corals was just mind-boggling. For those looking for macro subjects there was certainly no shortage of pygmy seahorses as we saw Denise, Bargibanti, and Santa Clause (the red and white Denise) on pretty much every dive. We had plenty of turtle encounters and we were also very lucky with mantas both in the Misool region as well as in the Dampier Strait. The diving could not have been better as everything worked out perfectly. When not diving we also enjoyed several cruises investigating and photographing the unique karst limestone formations that can be found in the Balbulol and Wayil area and also had the chance to wander around the island of Arborek and enjoy a very well performed dance by the kids. Of course we also presented our patented Underwater Tribe photo seminars each day and answered questions about photography for those interested. We were very impressed with the Mermaid II, the boat was quiet and the ride was smooth, the food was excellent and plentiful, and of course the crew and guides were absolutely outstanding! We are already planning our next trip aboard the vessel and are looking forward to another week with the Mermaid II. Special thanks for everyone who joined us on the trip, we hope you enjoyed it as much as we did and we are looking forward to seeing you all again soon. Enjoy some pics and stay tuned for a few short videos as well! 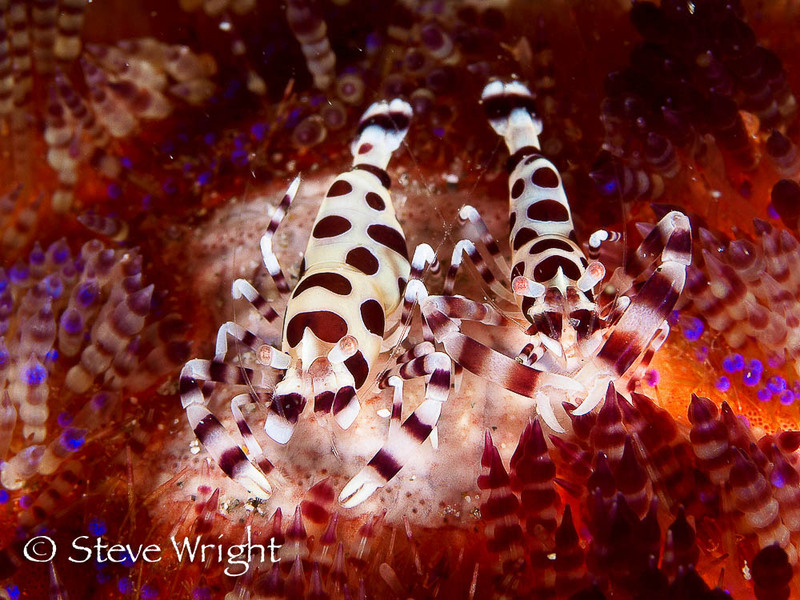 Here is the delayed final blog post from our recently completed First Underwater Tribe / Maluku Divers Photography Workshop which was held from the 18-25th of March 2015. 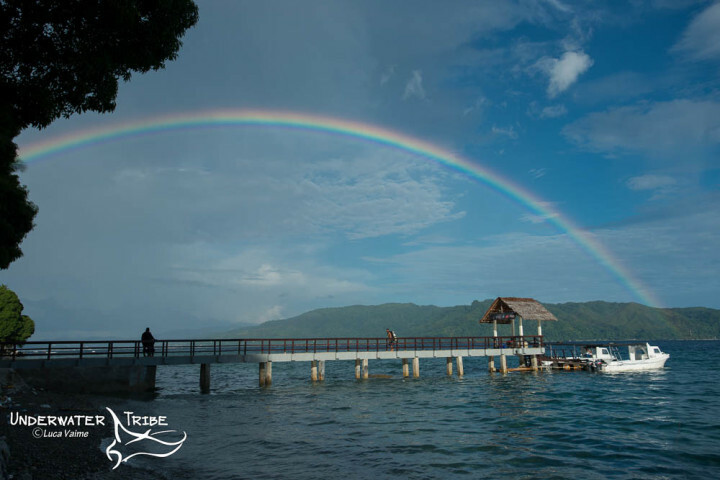 Although we have visited Ambon many times over the years and knew that Maluku Divers ran a fantastic operation, it was our first time holding a group event at the resort and we are happy to say that the entire thing went off without a hitch. The resort itself is well designed with 10 individual bungalows along with 4 spacious Garden Rooms, a dedicated camera room, a well appointed outdoor seating area for our presentations, numerous camera tanks and a well laid out dive gear area, and of course a restaurant that sat all of us in one big table along with fantastic food! 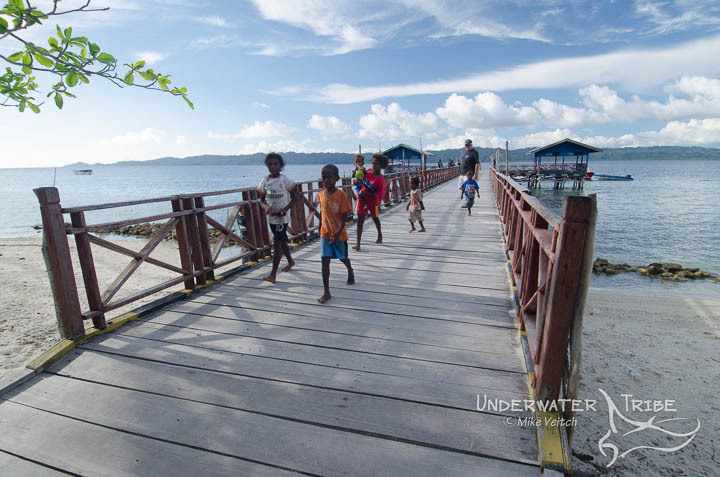 We can’t say enough great things about how well Maluku Divers runs the resort fro the seamless reservations ahead of time to the wonderful and friendly on site staff and management, the team really bent over backwards to provide us with everything we needed and then some. We will most definitely be back next year to enjoy the great macro diving and photo opportunities that we enjoyed with long bottom times and fantastic critter spotters. All of our guests arrived were on site by the morning of the 18th (a few had arrived ahead of time to get in a few extra dives) and we were able to split the groups and get out diving right away. 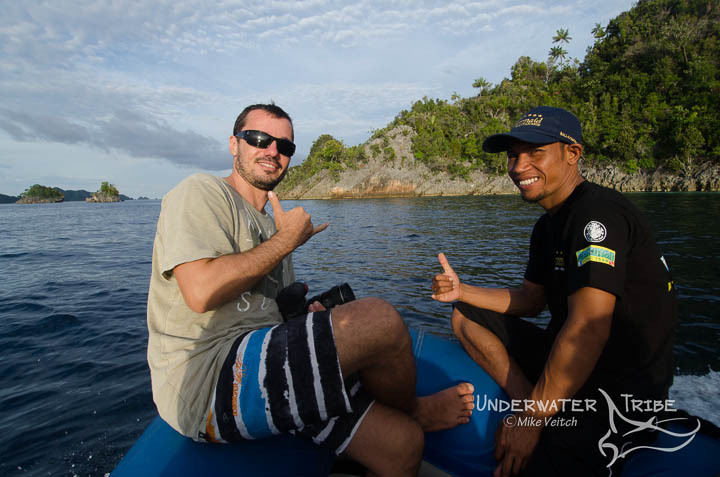 Each of our boats had a dive guide as well as a photo instructor aboard (neither myself or Luca carry cameras during the workshops, we only use our slates) so everyone was well looked after when it came time to finding critters and setting up the right way underwater. Our schedule consisted of 3 (very long!) 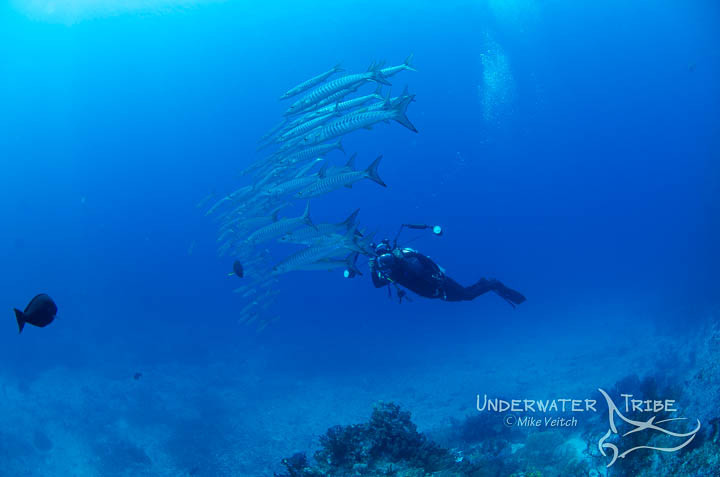 day dives per day, 2 before lunch and one after, as well as the opportunity to do an extra night dive if desired. During the dives Luca and myself would help the photographers underwater in many different ways including but not limited to: snoot holding, help with strobe placement, critter finding, backlighting, reassurance on camera settings, ideas about composition and lighting techniques. Each day we would present at least two different talks: one after lunch and one after dinner. After the third dive of the day we would meet in the common area to either go over the days dives, critique photos, or help with Lightroom in a “mini” workshop setting for those interested in learning more about that powerful program. Our talks at the beginning of the week concentrated on the basics of photography such as f-stops and shutter speeds and then became more “macro” specific by discussing macro composition, backgrounds, shallow depth of field, snooting, backlighting, and more! Feedback from the participants was fantastic as everyone felt they learned a lot from our presentations as well as the one to one underwater work. However, nothing spells success better than seeing the results of our students work and on the night of the 24th everyone had to opportunity to show off their best work of the week. 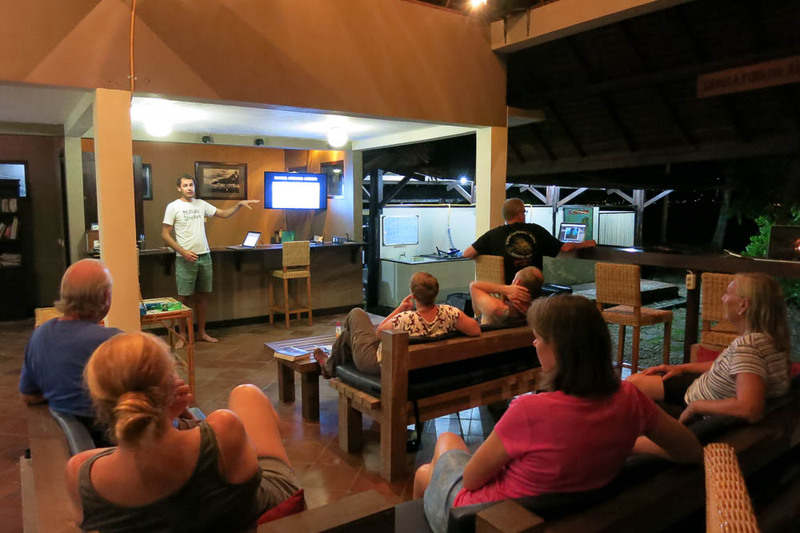 After a fantastic BBQ dinner put on by the Maluku Divers restaurant team we sat down (along with the other guests in attendance who weren’t a part of the workshop) to see the results of a week of diving in Ambon! The resulting slideshow of images I have to say is possibly the best set of images I have seen in any of our previous workshops throughout the world as everyone provided at least 15 fantastic images toward the show. As a special treat, we were also shown a beautiful video from our video shooting attendee Nannette, stunning imagery all around. 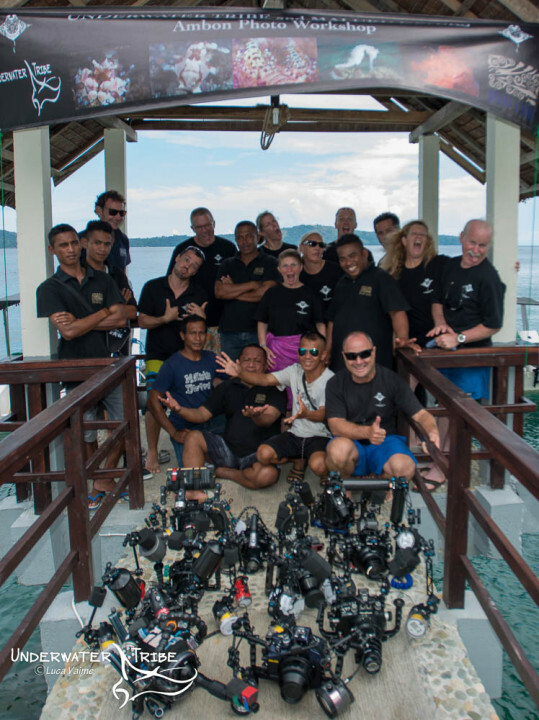 We would like to thank all of the attendees who came from all parts of the world to dive and learn with us! We had attendees from Australia, the USA, Malaysia, and the UK and we really enjoyed the camaraderie that was felt by all. 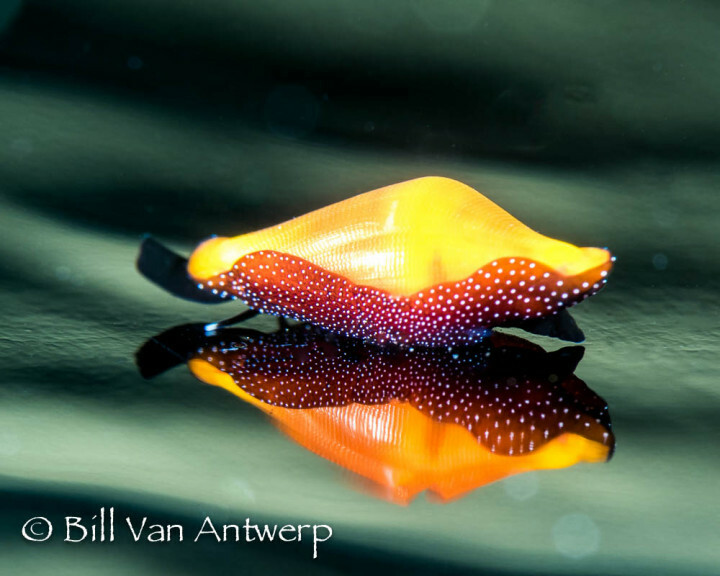 The relaxed tone and fun atmosphere was a great setting for learning photography, making new friends, and enjoying world class critter dives with a plethora of incredible subjects! 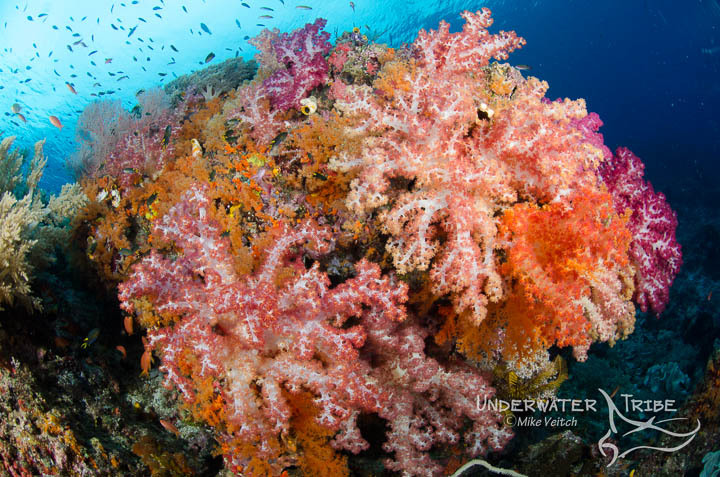 Thanks to all of our participants and the wonderful team at Maluku Divers, we will be back again soon!